Little voices echoed this prayer through our home as I grew up. My mom ran an in-home daycare with more than a handful of kids, and hearing this prayer before meals was a constant. 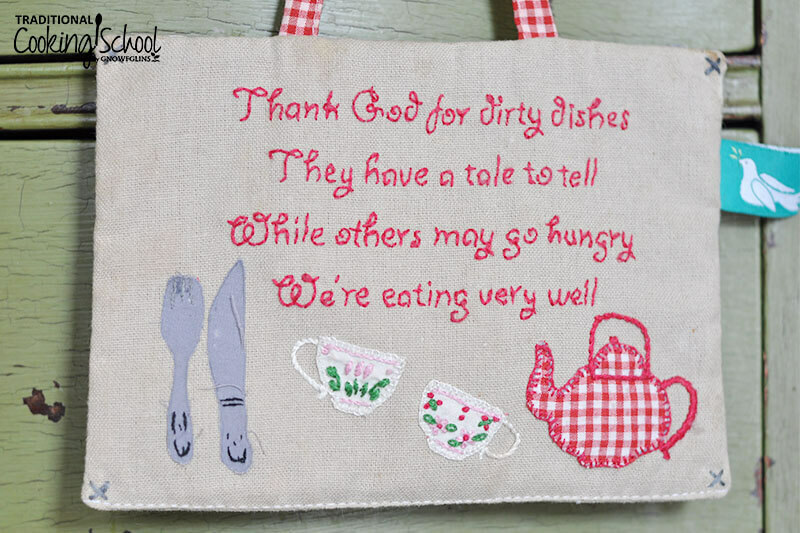 Most of us pray at mealtimes and teach our kids to do the same. But beyond that, do we really think about God as we go about our kitchen duties? 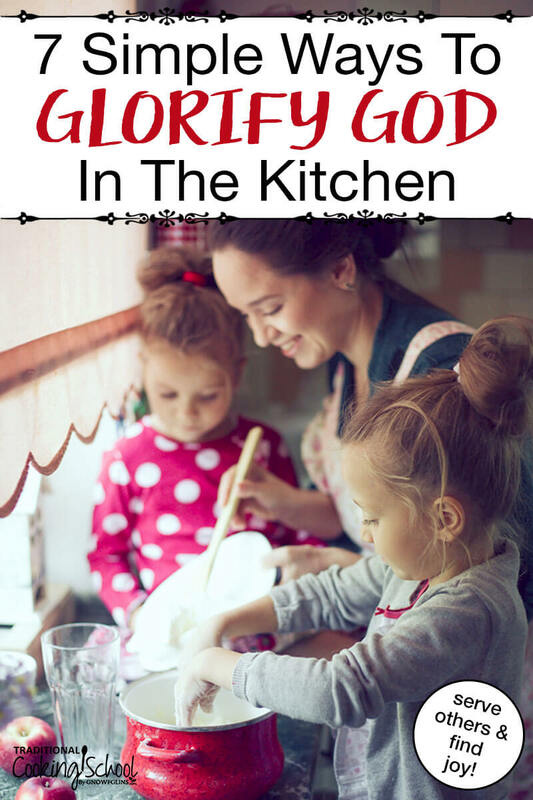 Today, we're exploring the heart of this Scripture with 7 ways to glorify God in the kitchen! These simple ideas make God the central hub of your kitchen so you can serve, share, and find daily joy in the most well-loved room of your home. Did you know you can glorify God in your food choices? When we eat foods that aren’t natural, that’s essentially what we’re doing! By eating GNOWFGLINS (God’s Natural, Organic, Whole Foods, Grown Locally, In Season), we are eating to glorify God and being good stewards of the bodies God gave us. Of course, we don't want to make food an idol (and a sugary cupcake will pass your lips from time to time), but when we strive to eat real food as much as possible and receive it with thanksgiving, we are better equipped to serve God. Take special note of the phrase “created by God”. God defines food in this passage as something created by Him. So try steer clear of things He didn't make (the processed, chemical-laden, fake stuff). For more on this topic, read What Does the Bible Say About Food? Does God Care What I Eat? Instead of whistling while we work, we're going to praise HIM! A much better use of our time, and more interesting. Let's face it, at times kitchen work feels like drudgery. Meals need to be cooked and dishes need to be washed… day in, day out. It can be difficult to have a heart of thankfulness and joy! God’s very good to us! To help you grow in thankfulness, read 6 Ways To Banish Stress And Find More Joy In The Kitchen And Your Life. It's amazing how something as simple is cooking and cleaning can help mold our hearts to be more like Jesus. Every time you're tempted to inwardly complain about the new stack of dishes in the sink or more meal prep, think of it as a service opportunity. A way to mold your heart into being more like Him. Remember when Jesus served the loaves and fishes to the crowd of 5,000? Now that's a lot of mouths to feed! As young girl, I was very particular about getting my hands dirty and especially disliked dishes. With after-dinner cleanup duty, my parents usually told me exactly what to do. Other than completing my specified tasks, I didn't lift a finger to do anything “extra”. This is the kind of heart we want to cultivate in our kids: to be observant and take the initiative in service. Is someone's glass empty? Refill it! Did a family member leave their dirty plate on the table? Take it to the sink for them! Is the floor sprinkled with crumbs? Grab a broom! Cheer your kids on when they complete these little tasks. Kitchen work also helps teach your kids about healthy foods and how to prepare them. For lots of ideas on this, read How to Get Your Kids to Eat Vegetables (and other yucky things). The Bible contains many examples of those who open their homes to share blessings: Abraham (Genesis 18), Samson's parents (Judges 13), the widow of Zarephath (1 Kings 17), Zacchaeus (Luke 19), Lydia (Acts 16), the people of Malta (Acts 28), and more. Yet sometimes it can feel like a huge undertaking, right? This is embarrassing to admit, but before guests arrive in our home my husband and I are usually tense and snapping at each other. Why? Because we are frantically cleaning and trying too hard to impress our guests! The grumbling happens, I think, because we are trying make sure that everything is perfect… rather than focusing on the real reason for hospitality: to connect and share life with others. Finally, one of the most memorable ways to glorify God in the kitchen is by preparing a meal for someone in need. Our family is so blessed to have been recipients of many delicious meals from generous hearts. These meals helped get us through stressful seasons of moving, new babies, and more. The thing is, cooking for someone else doesn't have to be fancy. In fact, the most memorable thing I received after the birth of my second baby was a large Tupperware full of freshly cut fruit. It was exactly what I needed! Here's a run-down of the best practices for cooking meals as ministry to others. Don't forget the disposable containers! Do you enjoy spending lots of time in your kitchen? How do you eat to glorify God and incorporate Him into your home? Mary is a minister's wife, mom of two boys, and ex-pat missionary to Scotland. 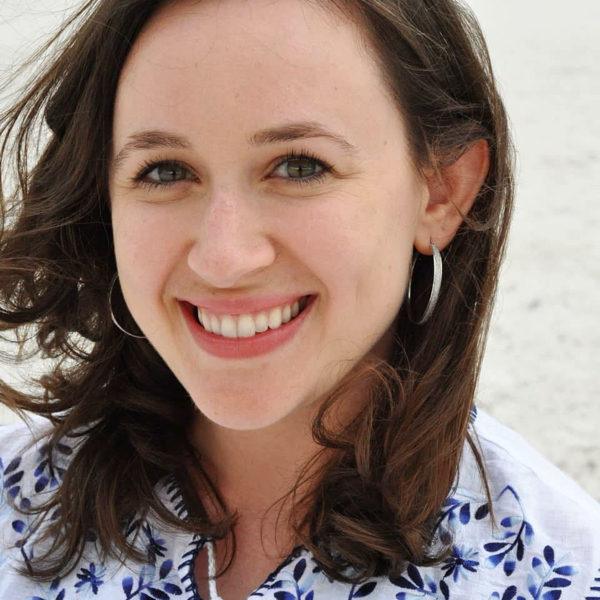 She’s also the creator of Healthy Christian Home, where she points to God's spiritual and physical nourishment through the natural world He has created. In her free time, you can find her with a cup of hot tea and a stack of books -- or watching a new BBC series. I love this so much!!! I so much needed this reminder, as I had been slipping into the grumbling mode. I DO want to glorify Him in this life He has given me, and what a great place to recognize as a perfect place to serve Him by serving others. Thank you for posting this. I’m bookmarking it!! I am so happy it encouraged you Aome! We serve a wonderful God!